Restrictive soil layers commonly known as hardpans restrict water and airflow in the soil profile and impede plant root growth below the plough depth. Preventing hardpans to form or ameliorate existing hardpans will allow plants root more deeply, increase water infiltration and reduce runoff, all resulting in greater amounts of water available for the crop (i.e. green water). However, there has been a lack of research on understanding the influence of transported disturbed soil particles (colloids) from the surface to the subsurface to form restrictive soil layers, which is a common occurrence in degraded soils. In this study, we investigated the effect of disturbed soil particles on clogging up of soil pores to form hardpans. Unsaturated sand column experiments were performed by applying 0.04 g/ml soil water solution in two sand textures. For each experiment, soil water solution infiltration process was visualized using a bright field microscope and soil particles remained in the sand column was quantified collecting and measuring leachate at the end of the experiment in the soil and water lab of Cornell University. Preliminary results show that accumulation of significant amount of soil particles occur in between sand particles and at air water interfaces, indicating the clogging of soil pores occurs as a result of disturbed fine soil particles transported from the soil surface to the subsurface. 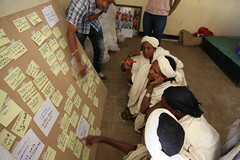 Poor rainwater management (RWM) practices and resultant problems of land degradation and low water productivity are severe problems in the rural highlands of Ethiopia. 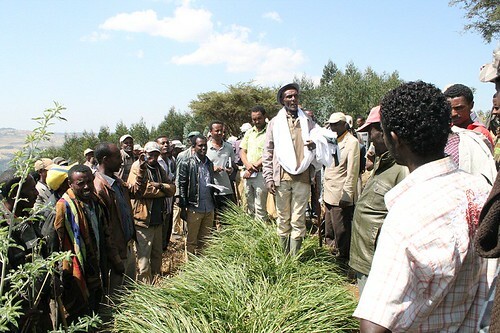 The current study was undertaken at Meja watershed, which is located in the Jeldu district of Oromia region. The study investigated rainwater management practices and associated socio-economic and biophysical conditions in the watershed. The existing RWM interventions, their extent and the nature of changes in land use and land cover (LULC) conditions were mapped and evaluated. Results indicated that over the two decades between 1990 and 2010 there was an increase in the extent of cultivated land and large expansion in eucalyptus plantation at the expense of natural forest and grazing lands. Results indicate that, with few exceptions of RWM interventions practised, there were mainly poor and inefficient rainwater management practices. The overall effect leads to inadequacy of water for household consumption, livestock and for intensifying agricultural production via small scale irrigation systems. Deforestation and poor resource management resulted in soil degradation, reduction of hydrological regimes and water productivities in the watershed.